The sale of the firm founded by incoming White House communications director Anthony Scaramucci to a Chinese conglomerate is undergoing a regulatory review. SkyBridge Capital agreed in January to sell itself for an undisclosed price to HNA Group, a deal-hungry Chinese company. The deal was struck as Scaramucci, who founded the hedge fund network in 2005, was preparing to join the Trump administration in a different role. The SkyBridge sale was expected to close at the end of June, but it is still pending "regulatory approvals," a SkyBridge Capital spokesperson said. "The close is proceeding as planned," the spokesperson said, adding that SkyBridge is "confident" it will close this summer. A person familiar with the matter told CNNMoney on Monday that the final hurdle the deal needs to clear is a review by the Committee on Foreign Investment in the United States. Known as CFIUS, this inter-agency committee is charged with evaluating sales of U.S. businesses to foreign entities to determine the impact on America's national security. CFIUS often reviews deals that give a foreign investor control of a U.S. business. It has reviewed everything from the acquisition of Sprint Nextel by Japan's SoftBank to Chinese acquisitions of Smithfield Foods and the Chicago Stock Exchange. The Treasury Department, which chairs CFIUS, declined to comment on whether the committee is reviewing the SkyBridge sale, citing laws that prevent disclosing such information. A Treasury spokesman said the department takes its role in this process "very seriously" to ensure "national security concerns" posed by foreign investment are identified and addressed. The news that CFIUS is reviewing the SkyBridge deal was previously reported by the Wall Street Journal, Bloomberg, Reuters and other news outlets. A spokeswoman said in a statement that the White House "is treating Mr. Scaramucci the same as every incoming official and is carefully considering all aspects of his holdings and businesses as part of the incoming ethics and legal review process." HNA did not respond to a request for comment. Lawyers who have worked on these national security exams, but who are not involved in the Skybridge sale, said deals involving buyers from certain countries can lead to prolonged reviews. "Countries not considered allies of the United States generate more scrutiny and those CFIUS reviews tends to take longer," said Jeremy Zucker, co-chair of Dechert's International Trade and Government Regulation practice. Zucker said that there appears to be a "growing number of Chinese transactions that encounter resistance with CFIUS." However, he added that can at least partially be explained by the surge of Chinese investment into the United States. China's foreign direct investment in the United States spiked to $46.2 billion in 2016, tripling from the year before, according to research firm Rhodium Group. HNA Group has been deeply involved in the Chinese M&A bonanza. Its parent company has announced nearly $17 billion of foreign investments since the beginning of 2016, according to Dealogic, a research firm that tracks corporate mergers. Almost half of those foreign deals, or $8.1 billion, have been in the United States. Up until now, HNA's biggest splash in America was a $6.5 billion purchase last October of a stake in Hilton Worldwide (HLT) from private-equity giant Blackstone Group (BX). HNA showed its interest in Western financial firms earlier this year when it surpassed the Qatari royal family to become the largest shareholder in Deutsche Bank (DB). The European Central Bank, which regulates banks, is considering whether the Deutsche Bank stakes held by HNA Group and Qatar will have a significant influence on the bank and its management, a person familiar with the matter told CNNMoney. If the answer is yes, the ECB would launch an investigation to understand more about each investor, the person said. The ECB declined to comment on the matter. National security reviews by CFIUS of Chinese deals pay particular attention to how close the buyer is to the Chinese government, experts in the review process say. That can be a complex task. "The extent of government ownership of key sectors of the Chinese economy guarantees that many deals will receive extra scrutiny," said John Reynolds, a partner at Davis Polk & Wardwell, a law firm that handles CFIUS cases. HNA Group has faced questions about its ownership structure and relationship with the government. In response, this week HNA revealed that more than 50% of the company is controlled by two charities: Hainan Cihang Charity Foundation Inc. and Hainan Province Cihang Foundation. Besides the treasury secretary, CFIUS includes the heads of various national security and economic agencies, including the Departments of Justice, Homeland Security, Defense, State, Commerce and Energy. During a 30-day review process, CFIUS members look at the transaction for potential national security risks. The review focuses on not only the foreign buyer, but how sensitive the asset being purchased is. Sometimes the buyers agree to certain conditions to ease national security concerns. After that initial review is completed, CFIUS can then sign off on the deal or launch an investigation that must be completed within 45 days. In very rare cases, the decision on whether to approve a transaction is left up to the president. In 2014, the most recent year for which stats are available, CFIUS reviewed 147 transactions and launched subsequent investigations into 52 of them. Just one of those applications was rejected, while 12 were withdrawn during the process. National security concerns caused China National Offshore Oil Company, or CNOOC, to drop its 2005 bid to acquire oil explorer Unocal, which was later purchased by Chevron (CVX). Treasury Secretary Steven Mnuchin said in June that the Trump administration is working with Congress on potential "fixes" to the CFIUS process, according to Bloomberg News. "We want to keep CFIUS as a national security review and we want to deal with economic issues separately. We don't want to confuse those issues," Mnuchin said at the time. Commerce Secretary Wilbur Ross said in June that "CFIUS is weak" when it comes to dealing with joint ventures and smaller foreign buyers, according to Politico. "There's a lot of talk within the administration about trying to build it up," Ross said. Scaramucci said he has worked with the Office of Government Ethics to remove potential conflicts of interest related to his business. "My start date is going to be in a couple of weeks so that it's 100% totally cleansed and clean. 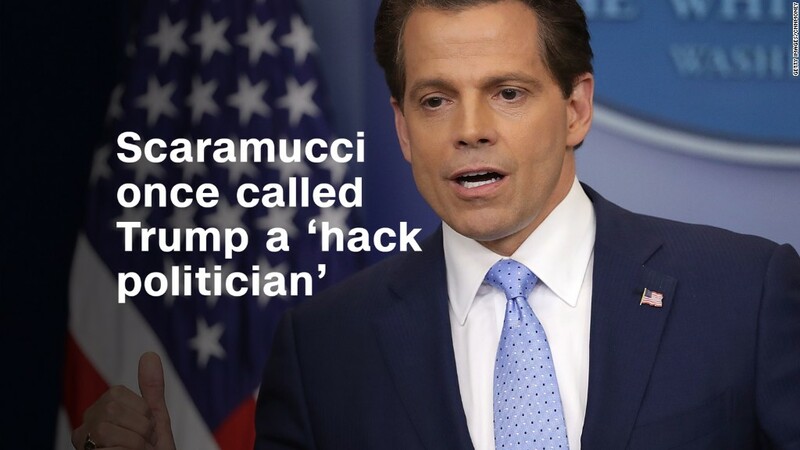 And I don't see an issue with it," Scaramucci told reporters on Friday. --CNNMoney's Alanna Petroff, Donna Borak, Daisy Lee and Shen Lu contributed to this report.